Provide comfort for the family of Christopher Stansberry with a meaningful gesture of sympathy. 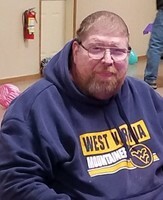 Christopher “Chris” Stansberry, 52, of New Martinsville died Thursday, April 4, 2019 while at Ruby surrounded by his family. Chris was born September 20, 1966 in New Martinsville, WV; son of the late Harold Rex and Ella Mae (Wade) Stansberry. Before he became ill he was a client supervisor for the drug court; loved shooting guns, fishing, spending time with family and friends and taking road trips; and he attended Limestone Methodist Church. 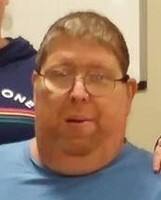 In addition to his parents, he was preceded in death by two sisters, Laura Stansberry and “Dani” Wade and two brothers, Gordon Stansberry and Charlie Stansberry. Surviving are four sisters, Regina (Aaron) Stout of Barnesville, OH, Melissa O’Neil of New Martinsville, WV, Melinda Stansberry of New Martinsville, WV and Angela (Greg) McDonald of Ellenboro, WV and several nieces, nephews and cousins. Friends received 11 am until time of service at 1 pm on Saturday, April 6, 2019 at the Jarvis-Williams Funeral Home, 1224 S Bridge St, New Martinsville. Burial at the convenience of the family at Limestone Cemetery. Memorial contributions may be made, in Chris’ name, to Limestone Methodist Church Cemetery Fund. To send flowers in memory of Christopher Harold "Chris" Stansberry, please visit our Heartfelt Sympathies Store. Lee Day Report Center, Jon & Susie Gordon, and others have sent flowers to the family of Christopher Harold "Chris" Stansberry. so sorry for your loss of someone so young. I am so sorry for the loss of your beloved Christopher. This is never easy to face, in fact, death can be viewed as an enemy. That's how our Creator Jehovah views it as according to 1 Cor. 15:26; which says, "And the last enemy, death, is to be brought to nothing." May you find comfort in knowing this and that he has a longing to conquer that enemy, to undo death by means of the resurrection. Please visit jw.org for more comforting information. Please accept our condolences. Chris will never be forgotten. Lee Day Report Center purchased flowers for the family of Christopher Stansberry.